Since 2003 The Bachelor has been running on ABC. Grouping 25 women together to have them fight over one man—pure genius. There is no question why The Bachelor has been running for 16 years. There inevitable drama that transpires makes for great entertainment. The audience is allowed to embark on the bachelors journey to find true love. 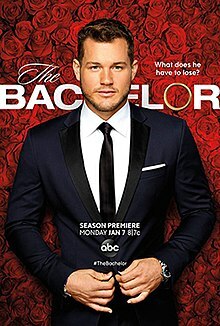 With many ups and downs throughout the season the bachelor will hopefully end up finding the love of his life within 11 weeks and proposing to her. Very realistic! Like I said, The Bachelor makes for great entertainment. Entertainment- that’s all it is. If you’re looking for anything more than a show that will be an enjoyable, drama filled 2 hours, then this is the wrong show for you. You may feel your IQ dropping as you watch this. Most of these women are not on the show for the right reasons. They just want to be on TV. Their jobs include: Content creator, Cinderella, Sloth, Model and more. They go on the show to gain popularity and a following, not to actually find love. This show is reality TV, but how much of it is reality? It’s no secret that The Bachelor is scripted, so how can anyone watch this show thinking any of it is real? Next time you watch a beautiful scene with two people developing a connection, think to yourself how many times they may have redone that scene. Think how much the producers have told them what to say or do. It’s hard to think about this because everything looks so real. In the end these people are really just actors listening to their producers. I would be naive to think that every person on The Bachelor is there for the wrong reasons. There are women really looking for love, and they find it. By the 11th week the bachelor has fallen deeply in love with one women and they get engaged, soon to be married. Well at least that is what’s supposed to happen. This show has aired for 22 seasons and only 5 couples have actually gotten married. And only 1 couple has actually lasted. 1 couple! Do these women not have an ounce of self-esteem or pride? The dreadful time they put themselves through just to be judged by one guy is dehumanizing. If they had any self-respect they would know that they can find a significant other without embarrassing themselves on national television. Can these gorgeous people really not find a significant other without the help of this show? It’s honestly pathetic. I cringe so much while watching seeing how dumb the producers make some of the women look. Being a 15 year old girl, I very much enjoy watching this show every week. Despite all of the facts I know I still look forward to watching every Monday, and I know a lot of other people feel the same way. The bottom line is, The Bachelor gives people a 2 hour long escape from reality where they can be entertained. There’s nothing more to it.